South Gallia defenders Kiley Stapleton (4), Christine Griffith (24) and Jessie Rutt (11) apply pressure to Federal Hocking’s Hannah Rose during the first half of Monday night’s TVC Hocking girls basketball contest in Mercerville, Ohio. MERCERVILLE, Ohio — The mistakes proved a bit too costly. 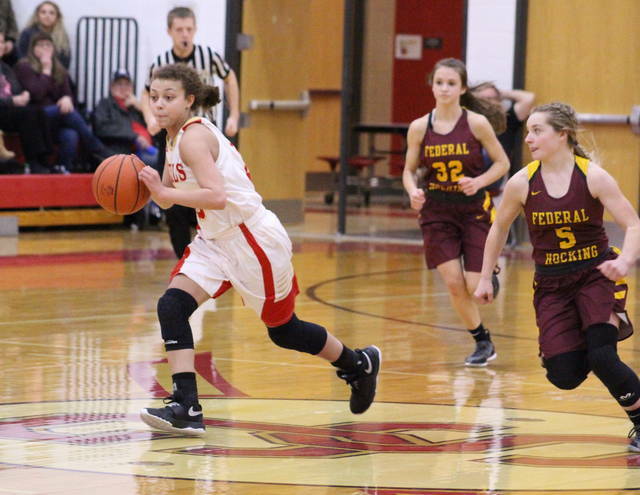 The South Gallia girls basketball team committed 24 of its 28 turnovers through three quarters of play, allowing visiting Federal Hocking to claim a season sweep in wire-to-wire fashion on Monday night during a 58-39 decision in a Tri-Valley Conference Hocking Division contest in Gallia County. The host Lady Rebels (5-11, 3-7 TVC Hocking) had seven miscues in each of the first two periods, which provided plenty of opportunistic moments for the Lady Lancers (5-8, 5-5) to build a 12-point halftime advantage. The Red and Gold were never closer as the hosts committed another 10 turnovers in the third canto, and FHHS benefited with a 23-9 surge that resulted in a commanding 54-28 cushion headed into the finale. SGHS held the Maroon and Gold scoreless over the final 4:33 of regulation and won the fourth stanza by an 11-4 margin, but ultimately never came closer than the final 19-point outcome. The Lady Lancers also won the first meeting between these two programs by a 67-36 margin in Stewart back on Dec. 3, 2018. South Gallia found itself in early holes of 4-0 and 9-2, but rallied with a quick 4-0 run that was capped by a Christine Griffith basket with 3:19 left in the opener — trimming the deficit down to a single possession at 9-6. The guests, however, answered with back-to-back trifectas from Emma Beha and Paige Tolson to extend the lead out to 15-6 with 1:48 remaining. SGHS did respond with the final three points of the frame, cutting the lead down to 15-9 through eight minutes of play. 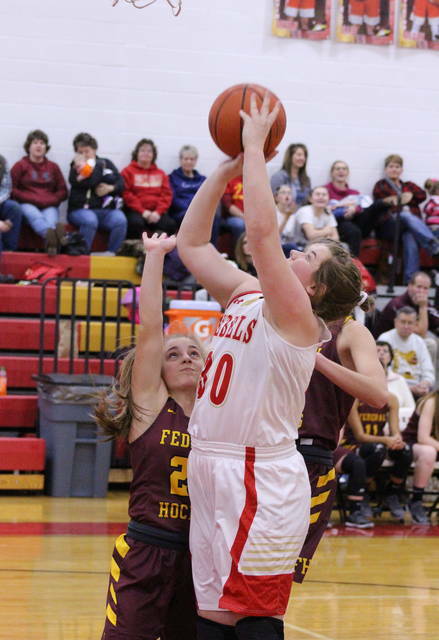 Fed Hock ballooned its advantage out to 11 points twice in the opening five minutes of the second quarter, but a Makayla Waugh basket with 2:02 left in the half ended a 4-0 run that trimmed the deficit down to 24-17. The Lady Lancers countered with a 7-2 surge the rest of the way, which included a bank-in trifecta from Tolson right before the halftime buzzer — giving the guests a 31-19 edge at the intermission. South Gallia — which shot 36 percent from the field in the first half — came up empty on its first 10 offensive possessions of the second half, which included seven turnovers to go along with three missed shot attempts. The end result was an 8-1 surge that nearly allowed Federal Hocking to double up its lead while holding a 39-20 edge at the 4:29 mark. Jessie Rutt came up with the hosts’ first field goal of the half with 4:18 remaining, but the Lady Lancers retaliated with a dozen consecutive points while securing their largest lead of the night at 51-22 with 55 seconds left in the canto. The Red and Gold closed the third with a 6-3 spurt for a 54-28 contest entering the fourth. Tolson ended a quick 4-2 run out of the final gate while increasing the lead to 58-30 with 4:34 remaining, but the hosts ended things with a 9-0 surge over the final 4:12 to complete the 19-point contest. 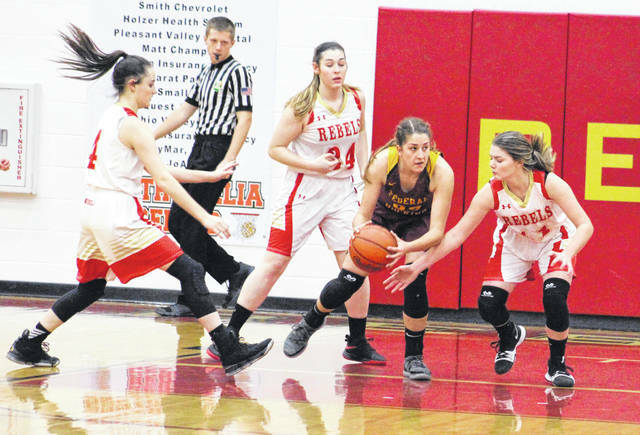 The Lady Rebels easily won the battle on the boards after posting a 37-27 overall advantage, which included a 21-17 edge on the offensive glass. The Lady Lancers — who produced 18 more shot attempts — also had 11 total turnovers, 17 fewer than the hosts. SGHS netted 15-of-45 field goal attempts for 33 percent, including a 1-of-10 effort from 3-point range for 10 percent. The Red and Gold were also 8-of-20 at the free throw line for 40 percent. Rutt paced the hosts with 14 points, followed by Christine Griffith with a double-double effort of 10 points and a game-high 15 rebounds. Amaya Howell was next with seven points and Kiley Stapleton was next with six markers. Waugh completed the scoring with two points. Stapleton and Rutt both followed Griffith with eight caroms apiece. Federal Hocking made 25-of-63 shot attempts for 40 percent, including a 5-of-21 effort from behind the arc for 24 percent. The guests were also 3-of-8 at the charity stripe for 38 percent. Tolson led the the Lady Lancers with a game-high 19 points, followed by Beha with 13 points and a team-best eight boards. Brianna Baker also contributed 10 markers in the triumph. Hannah Rose was next with eight points and Kylie Tabler added six points, while Alexis Smith completed the winning tally with two markers. Baker and Tolson followed Beha with five and four rebounds, respectively. South Gallia returns to action Thursday when it travels to Racine for a TVC Hocking contest against Southern at 6 p.m.